I am easy to manipulate. From the second I started it up Ori and the Blind Forest worked hard to make me cry, but it didn’t need to. I would’ve been bawling with a third of that effort. Maybe it’s because the vet had just given me bad news about my dog (hopefully the medicine works), or maybe it’s because my parents are hitting a certain age, or maybe it’s because I’ve lived the last twelve years with somebody who means more to me than anything else in this world, and the thought of losing her is too heartbreaking for words, but it’s not hard to make me sad by portraying the passage of time or the passing of loved ones, even in the abstract. Within five minutes Ori and the Blind Forest brought up death painfully and matter-of-factly, and I was immediately soaked with tears. I don’t know if the game earned it. Again, it’s easy to make people cry when you make them think about the death of a family member. When the death happens during Ori’s introduction the moment itself is muted and casually devastating, but the minutes before and after are cloying. That’s kind of the game in a nutshell, though—it hits its goals, but not as cleanly or directly as it should. After that one piercing moment of emotion I dove back into Ori and discovered an accomplished Metroid-style adventure with an aesthetic that seems vaguely indebted to a variety of world cultures and mythologies. With its focus on forest spirits and a sylvan setting it resembles a Miyazaki film, but there’s no explicit connection to Japanese mythology. It borrows the fundamental feeling of mythic storytelling to depict a basic hero’s journey, with all the loss and personal growth that entails. In practical terms that means I run an adorable little spirit named Ori from right to left and back again, jumping, coasting and double-jumping over obstacles while shooting enemies with deadly bolts. I’m lost in a sprawling forest with several distinctly themed districts, and accessing new areas often requires learning new skills. I can’t swim until I can. I can’t climb walls until I can. I can’t sail blissfully through the air with the purloined feather of an evil giant owl until I can. Meanwhile purple glowing enemies constantly shoot deadly blasts at me, or launch slop that briefly turns any surface into a life-ender, or charge towards me from various angles. Ori and I are just trying to save our forest, and these monsters have to complicate everything. Ori is weak at the start, and early on has to stick to defense and avoid all enemies. He quickly meets a small speck of light that’s both guide and weapon, directing Ori on his journey like a Zelda fairy while shooting deadly lightning bolts at enemies. Gradually Ori absorbs the abilities of fallen kin, learning how to double jump, climb walls and use enemy fire to quickly change direction midair. In classic Metroid fashion these abilities unlock previously unattainable areas, opening up wide swaths of territory or just revealing tiny nooks that hold new power-ups. Those power-ups can increase Ori’s life power or his energy reserves. Energy is used for powerful charged blasts that can quickly wipe out enemies or knock down certain walls blocking my path. That energy can also be used to open up erstwhile save portals—instead of tracking down save stations, Ori can save at any point, as long as he has enough energy stored up. Ori also gains ability points by defeating enemies, and those can be cashed in to unlock new perks on a simple skill tree. The ability to save at almost any point doesn’t reflect the Metroid playbook, but it’s a necessary concession to modern-day gaming. It removes some of the challenge traditionally expected from a game like this, but that type of challenge is now a relic that has grown increasingly frustrating over time. And Ori still limits how often I can save, so that’s still a strategic element I have to stay aware of while playing. 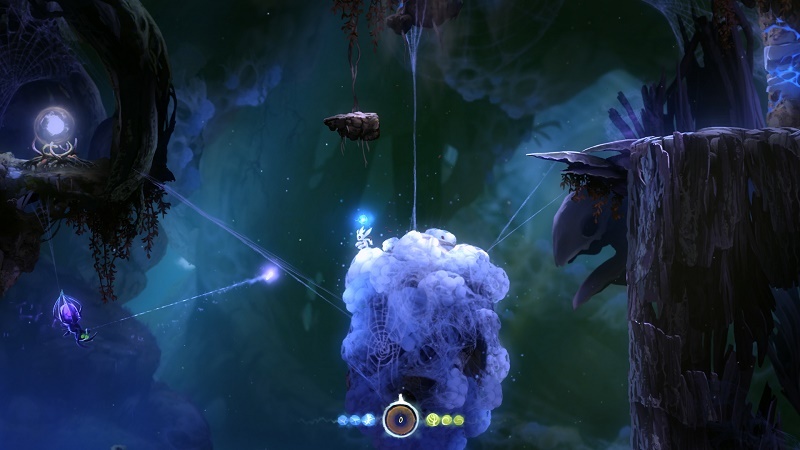 For most of its run Ori does a better job of keeping things fresh than most Metroid devotees—there are enough opportunities to explore old areas in new ways to keep the backtracking from becoming too repetitive. Many of the power-ups are explicitly motion based, making my character both faster and more maneuverable, further decreasing the pain of scampering through the same hallways over and over. I did get lost at times, and frustratingly went back and forth over old territory struggling for a lead, but that mostly happened when playing the game for the first time in hours, or in one instance when I misread the in-game map and saw a dead end that was not in fact a dead end. From a level design perspective, this is one of the most carefully planned non-Metroid games of this style. It’s a pretty game that’s smartly designed, but Ori and the Blind Forest stumbles over its own feet at times. The story is basic and transparent, but that doesn’t stop the game from periodically halting for ominous voiceovers in a made-up tongue with subtitles that are platitudes full of talk of light and dark. These interjections occur sparingly after a half-hour or so, but they remain annoying and unnecessary whenever they appear. They don’t elucidate the plot at all, say nothing specific and have the fake profundity of cookie fortune patter. 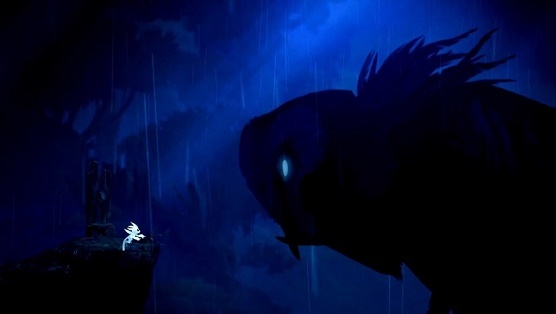 There might be rough patches, but the friction falls away when I’m locked into the core of Ori and the Blind Forest. We here at Paste Games believe that Metroid is pretty much the best game to emulate. Unlike games with concrete missions or levels, a great Metroid-style game never gives the player a reason to stop. They pull us through on a steady current of gradually expansive play that makes us never want to put the controller down. Ori expertly nails that rhythm, timing out its revelations and offering enough unique ways to navigate its world to maximize the player’s engagement. It also has a beautiful style that sticks out from the other major games in this genre, along with that powerful moment at the beginning that easily punctured my already weak emotional armor. The forest may be blind, but it still has a heart.